This beautiful lithograph, signed by the artist, was created and printed in Jerusalem. The Hebrew inscription is from Numbers 6:24-26. It translates as: "May God bless you and safeguard you. May God make His countenance shine upon you and be gracious to you. May God turn His countenance toward you and grant you peace." It is the prayer that the holy priests in the ancient Jewish Temple in Jerusalem used to give to the Jews who came to give sacrifices and is still given in Jewish congregations throughout the world by their descendants. It is also the prayer that Jewish parents give to their children on the eve of the Jewish Sabbath (Shabbat). 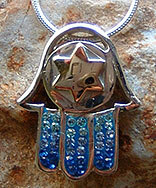 All of the symbols integrated into the piece are symbols against the evil eye which is said to be the bearer of bad luck. 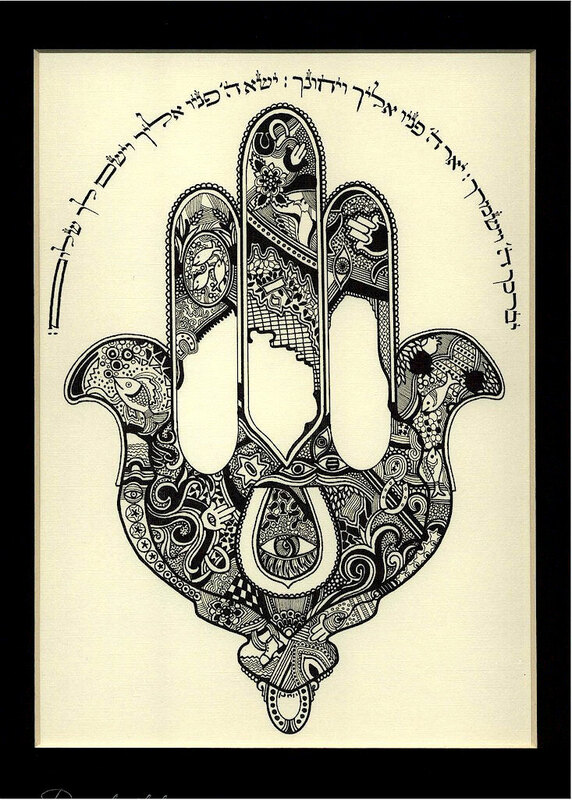 Many people put a hamsa on the walls of their homes, offices, and business to ward off the evil eye. I have one right next to my computer! It works! 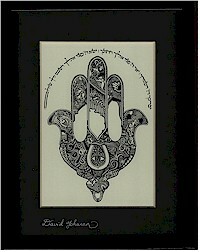 This is a beautiful gift for anyone of any religion and especially in any Jewish home. Customarily given on occasions such as: homewarming, birth of a child, weddings and just about any occasion! Measures: 11 x 13 inches. 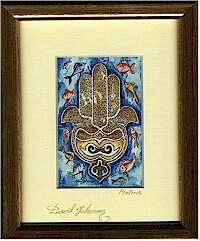 David Yohanan's work is not sold outside of Israel, this is the only place on the Internet to find his work. David Yohanan was born in Tiberius (Tveria), Israel in 1971. Already at an early age it was evident that he had extraordinary painting talents, and he was considered a child prodigy. At 12 years old, he participated in a national painting competition, reaped many accolades, and took First Prize. In 1987, he moved to Jerusalem and enrolled in the Betzalel School of Art, which also pursuing Judaic Studies in a yeshiva, and achieved mastery as a Scribe (Sofer Stam - Sofer Torah Umezusot). His dual talents are evidenced in the remarkable combinations of writing and decorations on klaf (holy parchments), incorporating symbols and quotations from the Bible, and Jerusalem scapes. Examples of his artistic creations include a Megilat Esther (scroll of the Book of Esther), ktubot (wedding agreements), depictions of pitum haktoret (the Temple incense mixture) and more. He has drawn hundreds of paintings in charcoal, aquatint, acrylic, oil and watercolors. His painting techniques include illuminations, microcaligraphy, papercuts and vitrage. The interweaving of colors and varied shapes give his paintings depth and exhibit remarkable creativity. In addition, the artist has shown great interior design talents; he designs aronot kodesh (Torah scroll arks) and Judaica art ornaments. 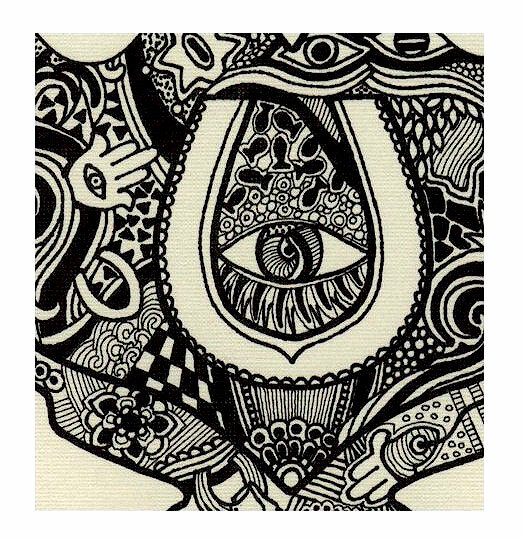 Mr. Yohanan has recently put out a series of original and unique Calligraphy paintings. His works of art are recognized widely in the art world, and adorn the homes of many famous people throughout the world.